There are a couple dozen on-site resorts at Disney World, and the variety can make the choice of where to stay feel overwhelming. The one I find myself booking time after time is Bay Lake Tower at Disney’s Contemporary. Find out if it is the right place for you, too! Bay Lake Tower (and its sister property Disney’s Contemporary Resort) are the only resorts at Disney World that are walking distance to Magic Kingdom. This is the number one reason Bay Lake Tower is my favorite resort. Bay Lake Tower is an on-site Disney World property located directly across the street from Magic Kingdom. It has clean lines and contemporary styling in the lobby and in the rooms as well. 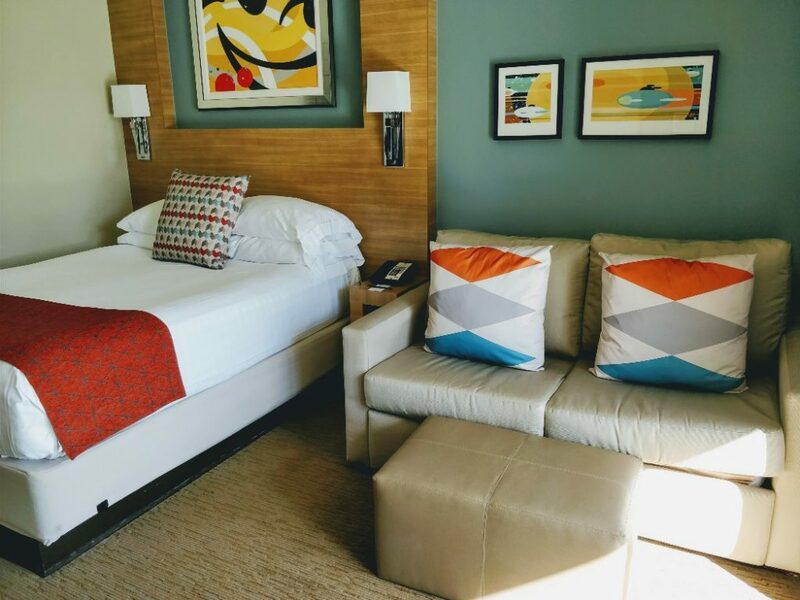 This matches well with the sister resort – aptly named Disney’s Contemporary Resort. Most of the dining, gift shops and amenities are located within Contemporary. This keeps the hustle and bustle to a minimum at Bay Lake Tower. Bay Lake Tower is very different from Contemporary in what to expect of the rooms. Instead of a traditional hotel room you will find a condo-type residence. There are 3 room types available in Bay Lake Tower: studio, 1-bedroom, or 2-bedroom villas. Each villa has a small kitchenette. 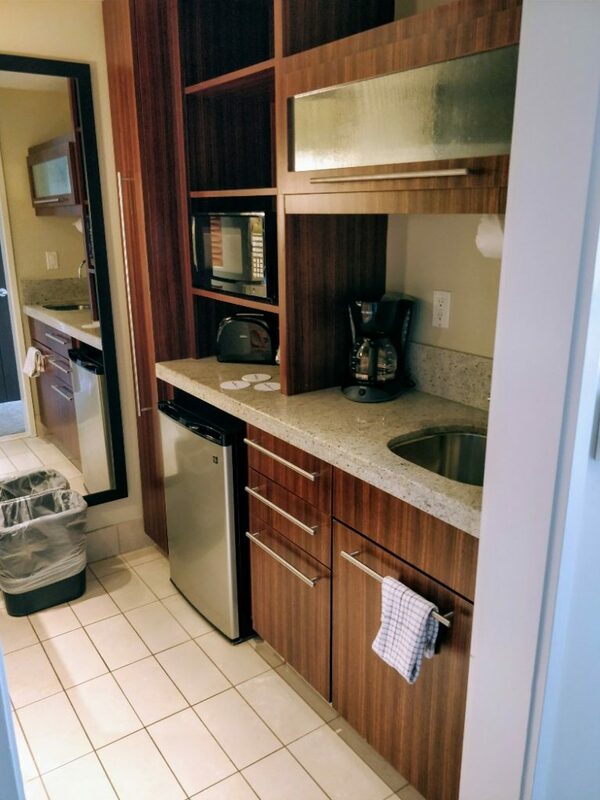 Not surprisingly the studio has a small galley kitchenette with mini-fridge and fewer amenities, whereas the 1 and 2 bedroom villas have a full kitchen with stove and regular refrigerator/freezer combo. Pro tip: The walkway between Disney’s Contemporary and Bay Lake Tower allows you a (partially obstructed) view of the Magic Kingdom fireworks. This can be a great way to experience some of the magic of fireworks without fighting the crowds leaving after the show. 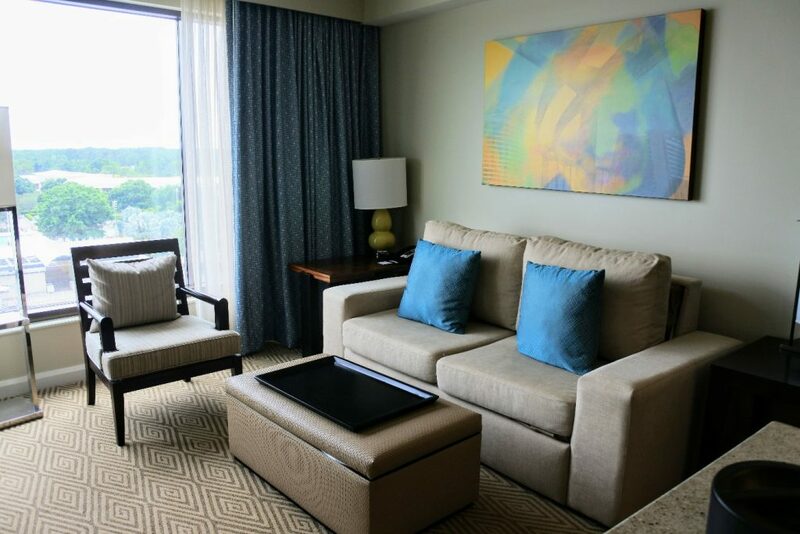 The 1 bedroom villa is our preferred room when staying at Bay Lake Towers. We love the spacious kitchen/dining area and the convenience of the full kitchen. I always order groceries from Garden Grocer for our Disney World vacations. We eat breakfast in our room each morning to save time and money. The living area in the 1 bedroom has both a fold-out couch and fold-out chair which provides additional sleeping options for larger families. There is also a second (smaller) full bathroom in the living area of the 1 bedroom villa. This second bathroom helps everyone get ready quickly and with out a fight. 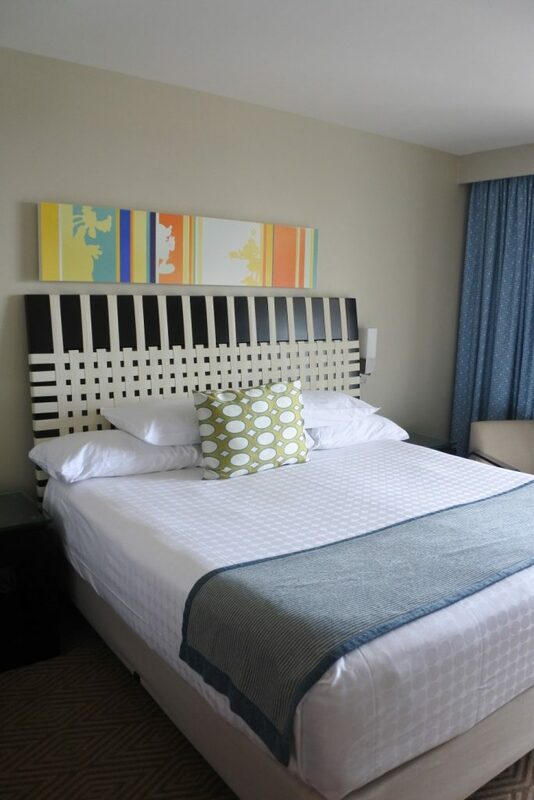 The main bedroom has a king-sized bed and en suite bathroom. 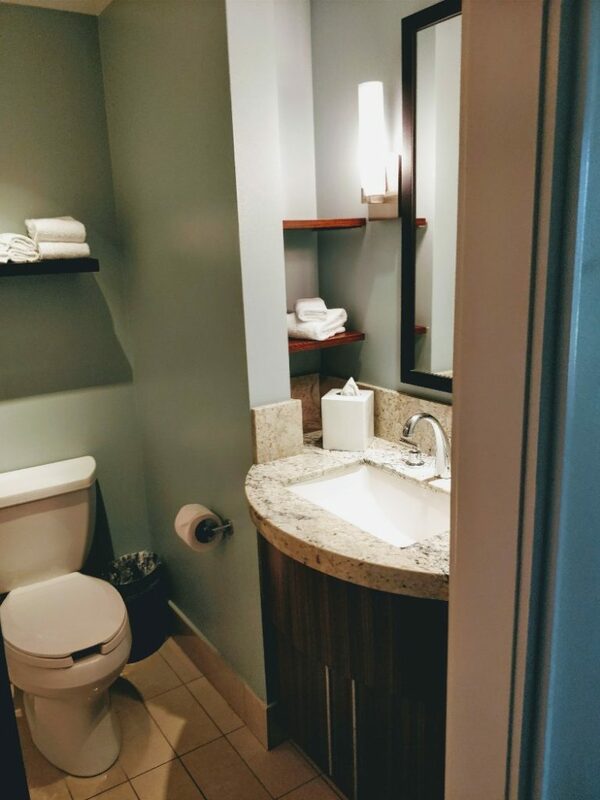 The studio villa is a great option if you aren’t looking for all of the space of a 1 bedroom villa, but want something a little more than a regular room at the Contemporary. The bedroom/living area was all one space with the queen-sized bed, fold-out couch, desk and tv with dresser all in the same area. 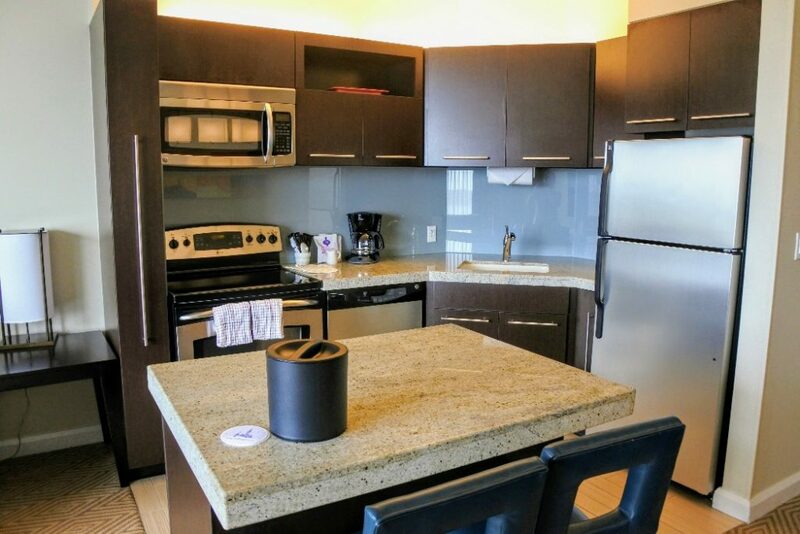 The galley kitchenette is found between the bathroom and bedroom area and has all your basic amenities. The bathroom was good enough, but after the extremely large bathroom in our Copper Creek Studio Villa it felt a bit cramped. Kitchenette with coffee pot, toaster, mini-fridge (no freezer), coffee cups, glasses and an assortment of paper plates and utensils. Our views have varied greatly at Bay Lake Tower. You can choose theme park view, standard view, or lake view. Each view has a different price point. On a couple of occasions we splurged on the theme park view. This meant we could watch the Magic Kingdom fireworks in our PJs (with the matching music on the TV). Those are some great memories! If you opt for a lake view room, know that around 10:35 pm each night the Electrical Water Pageant will float through the lake. This water pageant has moving light displays and loudspeakers to project the music. We enjoyed watching from our balcony on a recent trip, but it might be too loud for some. 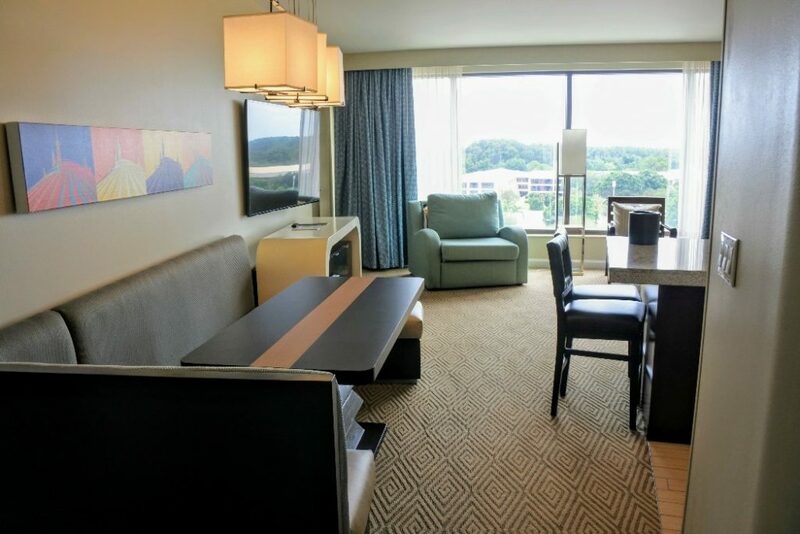 Standard rooms can be ones overlooking parking lots, walkways or have partial views of the lake or theme park. Overnight self-parking for resort guests is available at a fee of $24 per night. From your room to the gate at Magic Kingdom is about a 15-minute walk. If you prefer to save your steps for roaming the parks you can take the Monorail. The Monorail to Polynesian, Grand Floridian, and Magic Kingdom operates on a loop found inside Disney’s Contemporary Resort. To reach Epcot you take the Monorail from Contemporary to the Ticketing and Transportation Center (TTC) stop. At the TTC you exit the Monorail and follow signs to the other Monorail line. This Epcot Monorail will then go directly to Epcot. For Animal Kingdom, Hollywood Studios, Disney Springs, and the water parks you take a Disney World shuttle bus. These shuttle buses can be found outside of Disney’s Contemporary Resort. 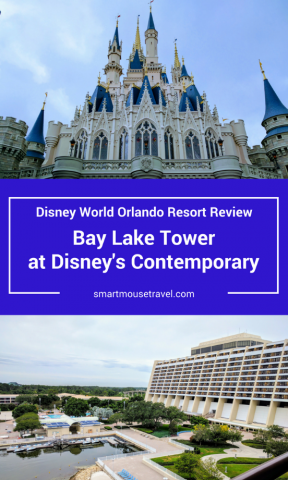 We love Bay Lake Tower at the Contemporary. Although the sleek, modern styling isn’t for everyone, we love the ability to walk to Magic Kingdom. The separate sleeping area in the 1-bedroom villa provides a nice option for when not everyone is ready for bed at night. Having 2 full bathrooms in the 1-bedroom villa also makes getting ready much easier with a large group. The fully equipped kitchen (found in 1- and 2-bedroom villas) is a great convenience for having breakfast before heading out to the parks. In fact, I love it so much that I talked our whole family into staying here for my niece’s first Disney World trip later this year! This sounds so great! 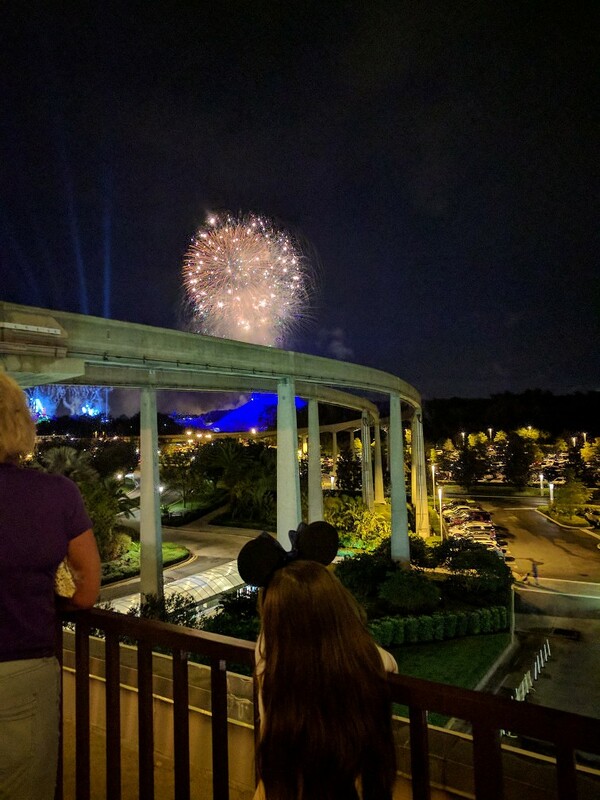 I love the idea of walking to MK and being able to see some fireworks from your bed! Plus the monorail is right there if you do need it!